Perfect for a lazy Thursday, this salad is filled with protein, vitamin K, vitamin C, fiber, manganese, vitamin B1, copper, iron, and oh, the list goes on! Did you know that romaine lettuce is a source of protein? A head of romaine lettuce head is 17% protein, and each serving provides approximately 1 gram of protein. At 2 grams of dietary fiber per serving, it also supplies double the dietary fiber of the other three most commonly consumed types of lettuce: iceberg, green leaf, and butterhead. It’s also packed with more vitamin A than a carrot! If you are new to leafy greens, romaine lettuce is a great lettuce to try first—the taste isn't as strong as other leafy greens and it has a great, crisp crunch to it. 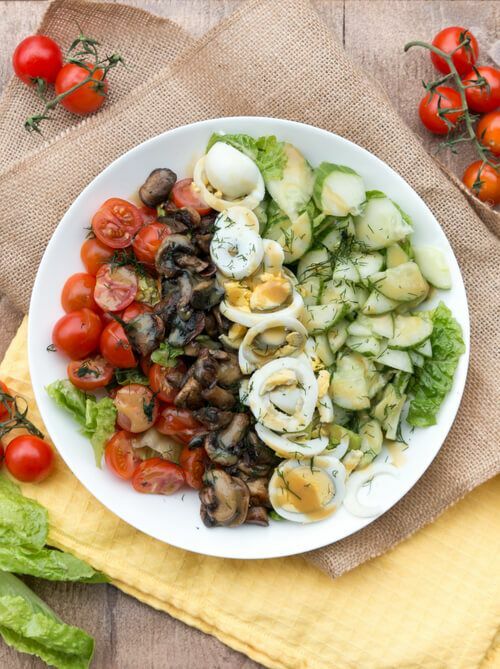 So enjoy this chopped salad that uses Romaine lettuce topped with mushrooms, cucumbers, tomatoes, eggs and a sweet, tasty vinaigrette. Romaine lettuce isn’t the only nutritious ingredient in this salad! Mushrooms are rich in vitamin B and cucumbers are low in calories! Sweet dijon vinaigrette: Whisk mustard, honey, oil, red wine vinegar, and salt in a small bowl. Set aside. Saute mushrooms in a skillet with 1 tablespoon olive oil and a pinch of salt for 2 minutes. Arrange lettuce, cucumbers, tomatoes, eggs, and mushrooms in a plate. Drizzle vinaigrette and sprinkle dill on top.